Wreaths Across America is looking for sponsors to honor those buried at Wilmington National Cemetery (Source: WECT). WILMINGTON, NC (WECT) - There are roughly 5,200 graves in Wilmington National Cemetery, and this holiday season one group hopes to adorn every single one with a Christmas wreath to honor the person buried there. Wreaths Across America (WAA) will once again be working in Wilmington to honor those buried in the cemetery. 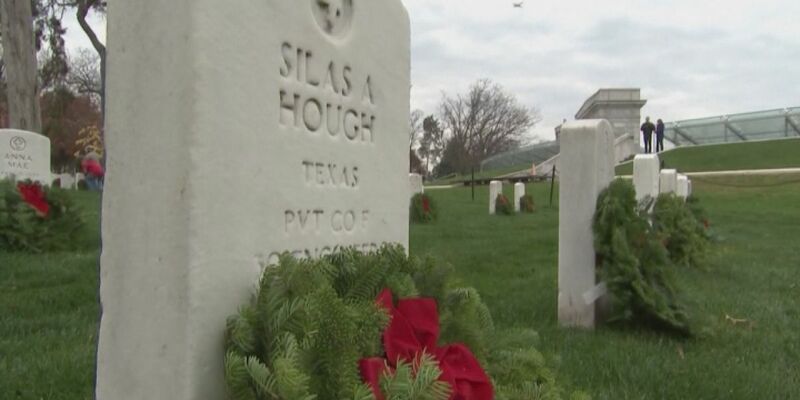 The organization operates across the country to place wreaths on military grave sites. Last year, the group was able to place a wreath on every grave in Wilmington National Cemetery — the first time the organization has been able to do so — and Retired Air Force Colonel Jerry West said he hopes the group can do it again this year. West said WAA operates through local sponsorship, and those wanting to donate can do so either to a specific group, or to the Wilmington cause at large. It is $15 to sponsor a wreath, and on Dec. 15, the group will hold a formal wreath-laying ceremony at Wilmington National Cemetery. At that ceremony, West said, attendees are asked to place a wreath and reflect on the sacrifice that person made. “After the ceremony, we ask all the people in attendance at the ceremony to go pick up a wreath, and take it and lay it on a grave site, and look at the person that’s buried there, look at their name, and remember them for what they have done,” he said. As of Nov. 13, about half of the wreaths at Wilmington National Cemetery had been sponsored. The ceremony will take place at noon on Saturday, Sept. 15. Volunteers are needed for the event. West said his group will be around Wilmington and the surrounding counties over the next several weeks to raise awareness and ask for sponsors. To sponsor a wreath at Wilmington National Cemetery, click here, or go to wreathsacrossameica.org and search for Wilmington.